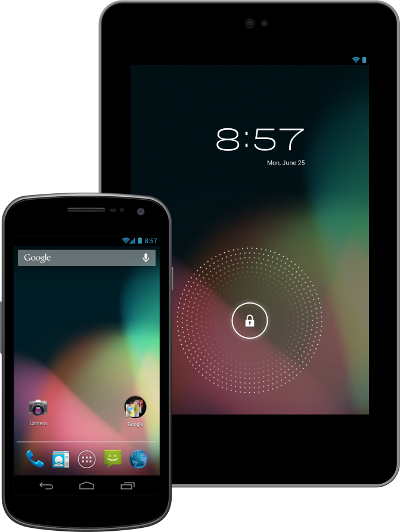 Android 4.1, Jelly Bean, is now official and will become available in July. The first devices to receive it will be the Galaxy Nexus, Nexus S, and XOOM, if you aren’t counting the Nexus 7 (our hands-on) which is already running it. After announcing it today at Google I/O, the Android team has posted the platform highlights, so that we can get a refresher of all of the new features. Jelly Bean will be the most impressive version of Android yet if we are talking about it on a performance level. They added triple buffering in the graphics pipeline, extended vsync timing, and tossed in some crazy intuitive touch responsiveness tech. They are calling this set of improvements Project Butter. One of the more visually impressive additions to Jelly Bean are the new expandable notifications. In Android 4.1, apps can be built to take advantage of a new notifications builder that lets them display more info than ever. Using a two fingered swipe, you can expand or collapse them or even perform actions directly without ever entering another app. Think of the new notifications as something no other platform has even come close to matching. The Google team introduced the world to their revamped voice search today, along with a new product called Google Now. You could call it their answer to Siri if you’d like, but really, this isn’t necessarily trying to go in that direction. Google just wants you to be able to search for things and receive answers back. That’s what the new voice search does, but to beef it up, they added voice playback and are trying to make it smarter than ever by having it recommend options depending on the time of day, location, or from previous searches. With Google Now, they are taking Search and making it more visual. The results you receive back from doing searches arrive as cards that have been built based on your search history. There are cards for weather, calendars, navigation routes you take often, sports scores from your favorite teams, and more. It has a beautiful UI and is definitely something to keep your eye on. Resizable widgets have been in Android for a while now, but not like this. In Jelly Bean, you can drag a widget onto another home screen, and depending on where you want to place it, Android will adjust your screen to make room for it. Also, if you try to drop a widget onto a home screen, but the widget is bigger than the amount of space you have available, JB will resize the widget to fit without any extra work from you. Yep, you are reading that correctly. In Jelly Bean, you can now use 720×720 resolution photos in your contacts. From the way it sounds, Gmail or other apps won’t overwrite them either. Hooray for pretty pictures again. Google announced two new functionalities for their NFC-based Android Beam this morning. The first allows you to share photos and videos with another device, similarly to what you can do with the Galaxy S3. The other new feature makes connecting to NFC-ready Bluetooth devices easier than ever. Simply tap your NFC phone to them and you are connected. Ice Cream Sandwich brought us data management, however, Jelly Bean has improved upon that to be much more accurate. Apps can now query the the data meter to see if a user should attempt to download something of substance that may push them over a limit. There is an entire section dedicated to all of the audio tweaks that have been added to Jelly Bean. We are talking multichannel audio, better USB audio for docks, and audio chaining. This is only the tip of the iceberg with Jelly Bean. 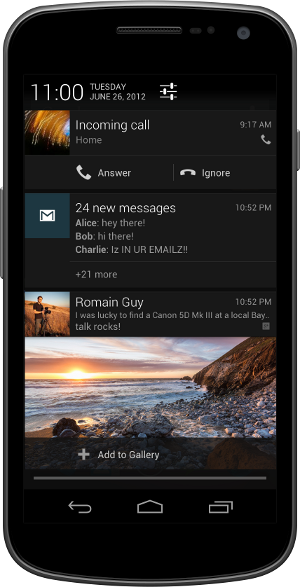 We recommend that you check out the full Jelly Bean highlights list to see everything that has been included. We know that some were thinking the jump from 4.0 to 4.1 would be minimal, but as we said before, that is a foolish way to look at it. This update is major.